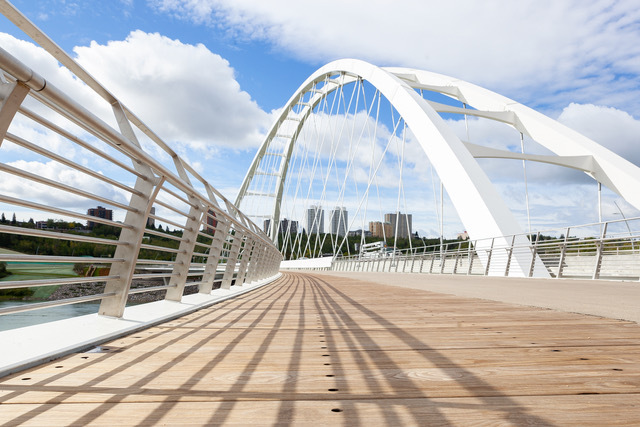 Modified wood decking has been used on the new Walterdale Bridge in Edmonton. After a two-year delay, the Walterdale Bridge in Edmonton has opened, offering increased vehicular, passenger, and pedestrian traffic flow across the North Saskatchewan River. Designed by Dialog, the new bridge replaces the old structure built in 1912-13. The new 230-m (755-ft) bridge features a signature arch structure at more than 49 m (160 ft) tall and serves as a gateway to Edmonton’s downtown core. A newly-opened shared-use path on the east side of the bridge invites walkers, runners, cyclists, stroller pushers, and wheelchairs to get closer to the river valley. This path is a smaller bridge beside the traffic bridge, sharing one of the arches for support. The design team incorporated modified wood decking on the pedestrian bridge. The wide crossing includes wood-fabricated seating to shelter people from prevailing winds. The pedestrian routes offer good accessibility and connectivity to the river valley’s extensive trail system. These newly-created passageways facilitated by the bridge’s arched design also accommodate public art and seating. As a prominent addition to the Edmonton skyline, the bridge is designed to be functional and beautiful. The signature steel arches and cable design hides utility pipes and cables that have been relocated from the old Walterdale Bridge. Dialog’s integrated design services for this project included structural engineering (bridge design), electrical engineering, architecture, and landscape architecture.